I just completed painting this "Blue Tree & Gray Clouds," that measures approximately 4 x 6 inches. I created this piece using gouache on paper. It is a lone tree that is coping beautifully, on a cold and cloudy day. Your trees are very expressive! Thank you very much, Kelly Lynn! Thank you very much, MsMaine! 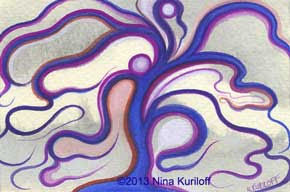 Small Painting of three trees - Magenta rules!